Sick of Disney? Anime movies can provide a great alternative for young viewers, opening up new cultures and ideas. However, a lot of anime isn’t for children. 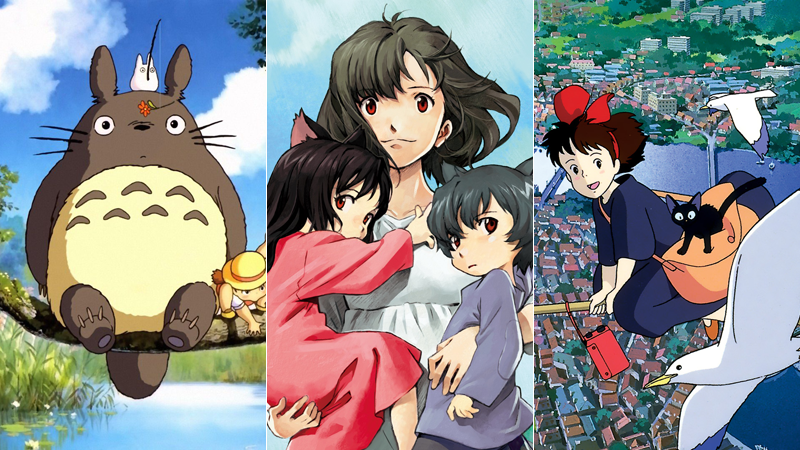 Here are five wonderful and age-appropriate anime films that little kids will love. This piece originally appeared 3/2/16. What is anime? In short, it’s the Japanese word for animation. It’s more than that, though. Since the country is culturally different from the West, showing anime to young children between the ages of 3 to 8 can introduce them to another world. Literally. This list needs a good cat movie, and The Cat Returns is a good cat movie. Schoolgirl Haru is able to talk to cats and one day she saves a cat from getting run over. The cat wasn’t any old feline, but the Prince of the Cat Kingdom. Kids of all ages should enjoy The Cat Returns. Not my personal favorite, but this isn’t about me. It’s about kids. Small kids. And I’ve found that small kids, generally speaking, adore this movie. Studio Ghibli’s lush take on the imagery and mythos of Hans Christian Andersen’s The Little Mermaid captivates younger viewers, as does the catchy soundtrack. Kiki, a young witch, makes her own way, moving to a small town and getting a job delivering bread. A charming film that’s perfect for all ages. The original Japanese soundtrack is fantastic, too, with some clever sound cues. Wolf Children tells the story of a woman facing the difficulties of raising children who are half human and half wolf. Directed by Mamoru Hosoda of The Girl Who Leapt Through Time fame, this movie will enchant kids and adults in equal measure. It’s one of the best films I’ve ever seen about the trials of being a parent. Wolf Children is magical for young and old alike. I’ve lost count of how many times this movie has played at my house. All three of my children have grown up on it, and all three love it. My Neighbor Totoro tells the story of a father and his two daughters who move to the countryside, while their mother recovers in a hospital. Magic soon follows, as director Hayao Miyazaki writes a love letter to the Japanese countryside and the imagination of children. Also, this movie has a catbus. It’s a bus that’s also a cat. What else do you need? This was a difficult list to put together, and I’ve left plenty of movies off. (The Doraemon movie, the Pokémon movies, Yo-Kai Watch and Professor Layton and a bunch more Ghibli movies and pre-Ghibli movies like Go! Panda, Go!, as well as TV series like Astro Boy, Speed Racer, Kimba the White Lion, Dragon Ball, Naruto…. and so on.) I hope you’ll share your own recommendations in the comments below. In case you missed it, here is Kotaku’s list of the best TV shows for little kids.